2001: A Space Odyssey is a countdown to tomorrow, a road map to human destiny, a quest for the infinite. It is a dazzling, Academy Award winning visual achievement, a compelling drama of man vs. machine, a stunning meld of music and motion. It may be the masterwork of director Stanley Kubrick (who co-wrote the screenplay with Arthur C. Clark) ... and it will likely excite, inspire and enthrall for generations. To begin his voyage into the future, Kubrick visits our prehistoric ape-ancestry past, then leaps millennia (via one of the most mind-blowing jump cuts ever conceived) into colonized space, and ultimately whisks astronaut Bowman (Keir Dullea) into uncharted realms of space, perhaps even into immortality. "Open the pod bay doors, HAL". Let the awe and mystery of a journey unlke any other begin. Prepare to flame, all ye who enter here! As I noted in my review of A Clockwork Orange, I've never been much of a fan of the work of Stanley Kubrick. Actually, ACO is the only film of his I really like. 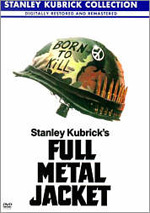 The Shining was a teenage favorite but it lost luster in later years, Spartacus and Dr. Strangelove seemed interesting but unspectacular, and I've always been downright hostile toward both 2001: A Space Odyssey and Full Metal Jacket. The fact of the matter is that I've only viewed 2001 once, and it's been a while. I watched - or should say, tried to watch - 2001 on laserdisc in 1992. and I thought it was a crashing bore. When I indicate that I "tried to watch it," I don't mean that I only made it part of the way through and stopped. No, what I do mean is that I liberally utilized the “fast forward” control on my laserdisc remote. That movie's nearly 140 minutes long, but I think I got through it in about an hour. Man, did that sucker seem dull and pointless! But I was just a young pup back then; I was only 25. Now that I'm an old man of 32, perhaps I have the wisdom and perspective that will fully let me appreciate Kubrick’s science fiction classic. Or maybe not. I'm sure it won't surprise you that I went into this screening with a bad attitude; after all, I expected that I would continue to dislike the film. Nonetheless, I resigned myself to my fate and I even swore that I wouldn't fast forward through any of the movie; I figured that if I truly were to give the picture a shot, I couldn't cut any corners. Amazingly, I kept to my word - though I was tempted to grab that remote at times - and I definitely found 2001 to be a much more intriguing experience than the one I endured years ago. A lot of this may be due to the additional perspective and information I've obtained since 1992. I knew a little about the film back then, but I wasn't very prepared for the style and pace at which the movie unfolds. Obviously, I knew what I was getting myself into this time. I've also learned more about the film in the interim. While I haven't gone out of my way to bone up on it, I've picked up little tidbits here and there about the movie's meaning and intentions through various newsgroups and whatnot. I don't know how much this additional information added to the experience, but it doubtless helped. As I watched it, I spent more time trying to decipher 2001. I doubt that I did too well in that regard, but I definitely saw more to it than I had in 1992. The impression I got was that Kubrick seemed to say that progress and evolution are frequently marked by negativity. When the monkeydudes in the "Dawn of Man" sequence discovered how to use tools, this growth was marked by violence. In the future, when scientists were able to create a computer that could actually think, how did we learn that it was truly becoming "human?" Because it started to make mistakes and because it became suspicious and paranoid. Kubrick also appeared to want to let us know that change isn't always a positive in the way he presented space travel. Whereas this area usually is shown as being thrilling and exciting, Kubrick makes it look monotonous and drab, as though it’s nothing more than the equivalent of riding on a bus. To me, the implication seems to be that we easily lose our sense of wonder and amazement, and that activities that once were captivating and magnificent eventually become tedious. Progress appears inevitable but not always positive. Were those themes intended by Kubrick? Again, maybe, maybe not. Probably the strongest aspect of 2001 is the fact that it's a virtual cinematic tabula rasa; one can interpret it in many different ways. Those messages are what I saw in it, but they may differ completely from what you or other folks interpreted. Who's right, who's wrong? Who knows? Probably both and neither of us. I admit that while I still can't say that I actually like 2001, I definitely respect it more than I did. It remains damned slow, and the temptation to shoot the film forward occasionally became great. At times I felt like I was watching Star Trek: The Motion Picture, which may well be the dullest movie of all time; shot after pointless shot of the Enterprise - ugh! Interestingly, I picked up on the obvious influence of 2001 on that film much more fully this time; in many ways, ST:TMP seems to be a virtual sequel to it. I also noticed the 2001 influences that showed up in films such as Close Encounters of the Third Kind and Alien. Granted, I much prefer those two films, but I can't ignore the impact 2001 had upon them. Visually, 2001 remains strong. Most of the effects haven't aged much over the last 30-plus years. Of course, they could spiff them up a lot, but there seems to be no reason to do so. Kubrick moved the film along at a very slow, deliberate pace, and the effects work quite well for it; flashier visuals would seem very out of place. Probably the area that needs the most improvement are the monkeymen; those costumes haven't held up too well. However, the space effects remain strong. Love it or hate it, 2001 does appear to be a singular work of art; as bored as I occasionally got, I can't argue that it should have been done differently. I really started to understand that when I watched the trailer for 2010. That picture appears to be much more conventionally structured and plotted. I probably should have welcomed that, but following two and a half hours of 2001, it seemed really odd and disconcerting. It's like when I watched the Clerks DVD last week; after I viewed a film, multiple outtakes, and a trailer that were all black and white, I saw the music video included on the DVD. It's in color, and I found that aspect made it extremely disconcerting to watch. I felt the same effect while I watched the 2010 trailer; I should have liked it, but it seemed so out of place that I found myself resenting the conventionality of it and almost missing the Kubrick style. Wow! I never thought I'd write a sentence like that! While my feelings about 2001 didn't exactly do a 180, they changed quite a bit since I first saw it in 1992. Perhaps future screenings will alter them further - that remains to be seen. All I know is that while I still am not wild about 2001, I definitely respect it. 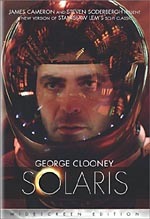 2001: A Space Odyssey appears in an aspect ratio of approximately 2.20:1 on this single-sided, double-layered DVD; the image has not been enhanced for 16X9 televisions. 2001 offered a generally satisfactory picture quality throughout the film. At times, it seemed vaguely soft and somewhat flat, but it also displayed pretty solid colors and it boasted no obvious grain. I occasionally saw some speckles or other marks, but film flaws were minimal. All in all, it was decent and watchable, but unspectacular. Because of the movie's stature, it was a bit of a disappointment, but it was still pretty good. Happily, 2001 offered a very nice Dolby Digital 5.1 sound mix. The audio seemed slightly tinny at times, but it was usually surprisingly natural and clean. The front soundstage appeared quite engaging, with some pretty effective use of all three channels. The rear speakers also displayed a relatively high level of activity for a film of this era; although I didn't detect any split surround usage, I thought that the rears were used pretty frequently and effectively, with lots of music and ambient effects emanating from them. Overall, it was an excellent mix for such an old film. 2001 offers three supplements. We receive two trailers - one for 2001 and another for 2010 - plus a 20 minute conference appearance from author Arthur C. Clarke. The trailers are interesting (except for the fact I found the 2010 clip unintentionally disconcerting) but nothing special. I liked the Clarke clip quite a lot, however. It comes from some sort of dinner conference that took place in 1968 prior to the release of the film. He doesn't offer a tremendous amount of insight into the film, but it's great fun to hear his thoughts. 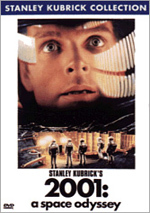 Before I watched the DVD of 2001: A Space Odyssey, I had maintained a strong dislike of the film for years. While this new screening didn’t make me a fan of the picture, it definitely opened my eyes to a degree; at least now I better appreciate some of the movie’s strengths. The DVD provided generally positive picture and sound plus a few minor extras. Ultimately, 2001 has endured as a science fiction classic for years - love it or hate it, it deserves to be seen.